One large sinkhole resulted where the water main break occurred on the north side of the street and a second sinkhole was created on the south side of the street with the water main exposed. The roadway between the two sinkholes is unstable. The break is on NE 205th between 45th where the green park ends and 37th. All the streets have two names - one in each county. 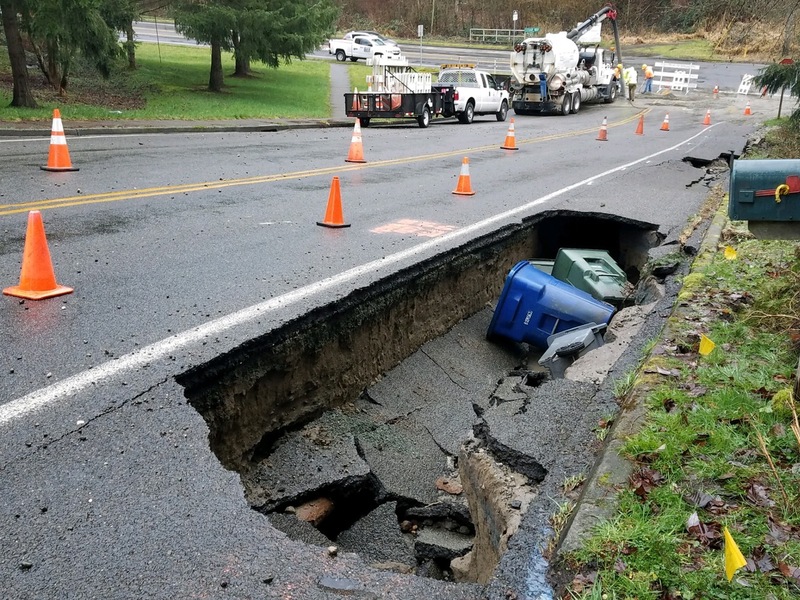 So the two sinkholes are actually on 244th St SW in Mountlake Terrace and NE 205th in Shoreline. 37th Ave NE becomes Cedar Way as it crosses 205th/244th. Road closures include 244th Street SW between 45th Avenue W and Cedar Way in Mountlake Terrace, and NE 205th Street between 33rd and 37th Avenues in Lake Forest Park. Crews have been on site assessing the damage and making repairs. Residents of 43rd Avenue W are currently without water and the Department of Ecology was notified of sediment that was carried into Lyon Creek. The situation is ongoing and at this time, the roadway will be closed at least overnight. Stay tuned for additional updates as more information becomes available. Updates will be posted on the the website for Mountlake Terrace, City of Mountlake Terrace Government on Facebook, and CityofMLT on Twitter.